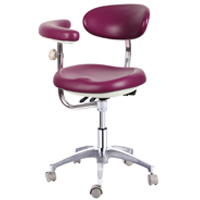 A dental assistant chairs and stools are a key piece of equipment in a dental practice. The most important quality to have in a dental assistant stool is adjustability. From there a few qualities to look for are durability, easy to clean, comfort and support. Seat shapes vary greatly between stools and can include round, saddle, contour and rectangular. The backrest of a dental assistant chair varies in shape and may be adjustable and feature lumbar support. The armrest/ abdominal support arm is an important aspect in a dental assistant stool and should be adjustable for proper support. A footrest is always a good option to have. Dental assistants stools should be constructed of strong and durable materials that are easy to clean, like vinyl. Be sure to choose a reputable vendor who offers replaceable upholstery.